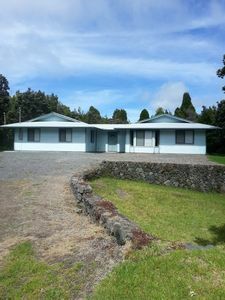 Your own room in a gorgeous house on one acre in the nice neighborhood of Leilani Estates. Hot tub on the back lanai overlooking the one acre backyard, with 40 species of palm tree as well as many local plants, is hard to beat. 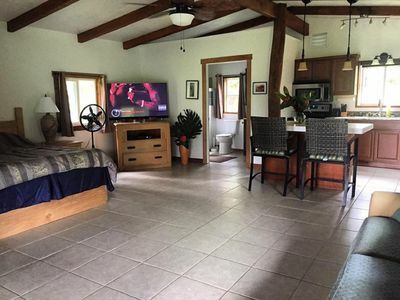 This house offers all the modern amenities and a gorgeous space for enjoying Hawaii, near all that the Big Island has to offer, including lava, ocean, Pahoa. 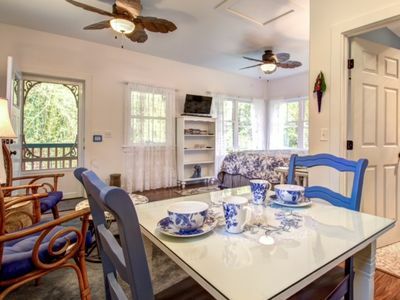 You’ll love my place because it's very comfortable, peaceful, beautiful, and because of the kitchen, the art, high ceilings, the views, and the location. 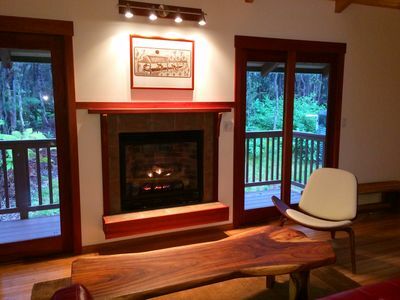 My place is good for couples, solo adventurers, business travelers. Not good for kids. This is a fully solar-powered 2,800 sq. ft home, but connected to the grid so there are no compromises, making this house a model of sustainability. 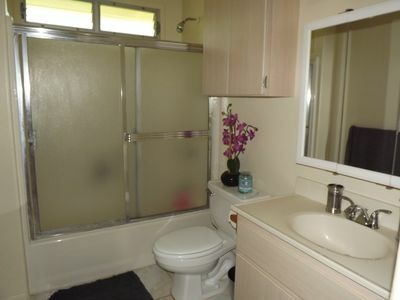 You have a private room with its own lounge area and your own bathroom. You share the kitchen and the rest of the house with the owners. The grounds are landscaped with many exotic palms and other tropical species, mango trees, avocado trees, a lemon tree and a bunch of banana stands. Fresh fruit? Yes. We have two cats so should like the furry friends if you want to stay here! You won't have to take care of them in any way, but they will be around and doing their thing. If I'm on the island I'll orient you and give you tips for enjoying the island. I travel a lot, however, so I may not be around, in which case my property manager will orient you. 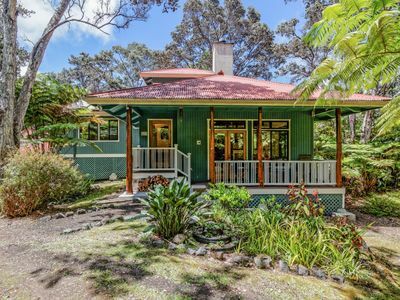 Leilani Estates is the gem of Puna, with one acre lots and strong community rules regarding what kind of homes can be built and how they are maintained. The community is a lot of fun to just cruise around (we have two cruiser bikes for guests) and check out homes and landscaping. 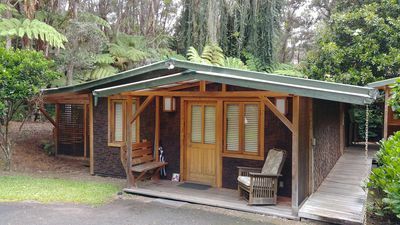 Pahoa is a quaint plantation town turned hippy central and is the heart of Puna. Lava viewing is fifteen minutes drive from the house and then a four hour hike or half hour bike ride (if you rent bikes). It's worth it! The Red Road area of coastal Puna is world class and just gorgeous. There are many yoga sanctuaries (Kalani, Hawaiian Sanctuary, etc.) and workshop centers in this area, as well as rich jungle, local fruit and a ton of other cool things going on. Volcano National Park is 45 minutes away and is a must see. There are oodles of trails in and around the park for avid hikers. Mauna Kea and Mauna Loa, two of the largest volcanoes in the world (with Mauna Loa still classed as active) are nearby and hikable. The Hamakua Coast north of Hilo is also a must see and an amazing scenic drive. Hilo town is the biggest city on the island (and the second biggest in Hawaii) and is well worth a visit, particularly to Pineapples restaurant or Moon & Turtle restaurant. Queen Liliuokalani Gardens is stunning with a mix of Hawaiian and Japanese aesthetics. Be sure to check out Coconut Island. Kehena Beach on the Red Road is a clothing optional black sand beach that is always nice for snorkeling or just lounging on the beach people watching. Sundays go off in particular, with a large drum circle. 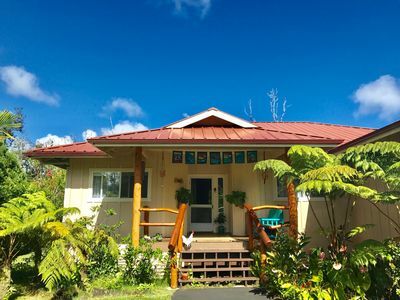 Kalani is a yoga and retreat center that also has epic ecstatic dance every Sunday morning at 11. This is a two hour moving meditation (no talking, drugs or alcohol allowed) to great music with beautiful people all around. It's a real journey each time and excellent soul therapy. Ahalanui warm pond is a large public hot spring-fed pool a little further up the Red Road from Pohoiki. It's a lot of fun any time of day but morning soaks are to die for. 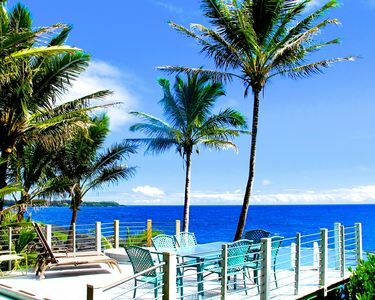 Kapoho offers excellent snorkeling and "champagne" warm ponds that are well worth checking out. Kona side of the island has its own mix of amazing beaches and resorts for a more traditional Hawaii feel. Scuba diving is good all over but most tours leave from the Kona side. Car is definitely best for getting around but you can walk to the bus stop half a mile away and the bus goes all over the island. Or you can bike or, if you're brave, try your thumb at hitchhiking, a common mode of travel in this part of the world. I may have a car I can rent to you (either a Smart car two seater or a good Infiniti SUV "island car"). Please inquire. 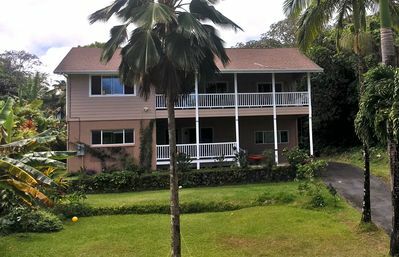 New Pa'ani Home Near Volcano Golf Course & Village! S&S Getaways your tropical escape in paradise!